Welcome to the Math Salamanders 5 Digit Subtraction Worksheets. Here you will find a wide range of free printable 5 Digit Subtraction Worksheets, which will help your child learn to subtract integers with up to 5 digits. 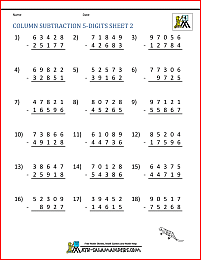 Here you will find a selection of Fourth Grade Subtraction sheets designed to help your child improve their written subtraction skills. The sheets are graded so that the easier ones are at the top. 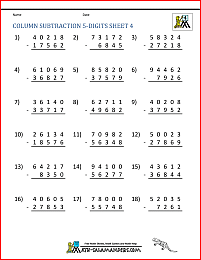 learn to use column subtraction with 5 digit numbers. 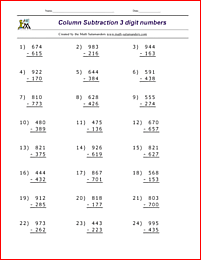 Here you will find a range of Free Printable 4th Grade Subtraction Worksheets. The following worksheets involve using the 4th Grade Math skills of subtracting numbers, and solving subtraction problems. learn to subtract numbers involving money with decimals with up to two decimal places. All the Fourth Grade Math Worksheets in this section follow the Elementary Math Benchmarks for Fourth Grade.